Innovation And Problem Solving Tools | Fulcrum ConsultingWorks Inc. In today’s podcast Rebecca explains why using problem-solving tools can create the future you seek, and why creative innovation processes contribute to problem solving. 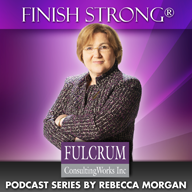 This entry was posted in Podcast Series: Finish Strong® and tagged innovation, problem solving tools by Becky. Bookmark the permalink.